It’ s April and temperatures should have risen but I am writing this post while outside it is freezing cold and raining. I guess this is the downside of living in the north of Spain! I know this not the perfect time to share this activity as we are all heading for final exams, and I certainly don’t expect any teachers to email me right away suggesting a collaboration for the next month, but I do hope you do not forget this post and that the next school year we can find a way to collaborate and join our classes. To encourage autonomous learning: to find new ways of learning and offer more opportunities for students to do more oral practice in a safe environment outside the walls of the classroom. To encourage the use of effective technology. For this project, we used Flipgrid. To demonstrate how anybody can use technology as long as you explain and model how to do it. Some of the students in this project are older than 70. To collaborate: To spice up the activity by having students from other regions and countries collaborate with my class. Flipgrid is a powerful reliable website owned by Microsoft. It is 100% free. It is a fantastic platform for collecting video responses to prompts that you pose to your students. Students can improve their speaking ability from their homes, repeating their performances as often as they like. Stress-free. Teachers can listen and send written or video feedback via email if they wish. Students don’t need an email address, which is perfect for younger students. Students record or upload a video and they can pause while recording, trim their videos and add more time or just delete it and start all over again. Recording time goes from 15 seconds to 5 minutes. They can reply to each other’s videos. You can easily connect your class with other classes, not only in your country but also all around the world using the GridPal feature. There are thousands of educators willing to connect. Flipgrid works on computers, laptops or any mobile device. If you use a mobile device to make your video, as my students did, you’ll need to download the free app. That was the first step. I needed 3 teachers from 3 different regions who had some knowledge of how Flipgrid worked. To be honest, I didn’t feel like sending tons of emails to the different schools asking for collaboration. I thought it would be time-consuming and probably ineffective. Besides, I am very active on Facebook and Twitter and I thought it was the fastest way to find potential collaborators. And Bingo! In just one week I had my 3 teachers: Purva Bachani from EOI Guía (Sta María de Guía- Las Palmas(Gran Canaria), Marisa Rodríguez from EOI San Roque (San Roque-Cadiz) and Silvia Oslé from EOI Torrelavega (Torrelavega-Cantabria). We have never seen each other, but we share the same passion: teaching. We created a Whatsapp group to speed up the process of setting up the project. I created the common grid (class) and using the Grid Actions Button selected Add Copilots. Then, I added Marisa’s, Purva’s and Silvia’s emails and sent them an invitation. From that moment, they had all the permissions to edit and add topics, but they could not delete the Grid (class)or the Topic I had previously created. As it was the beginning of the course, we decided to do two activities (explained below), trying to maximize as much as possible the interactive part. 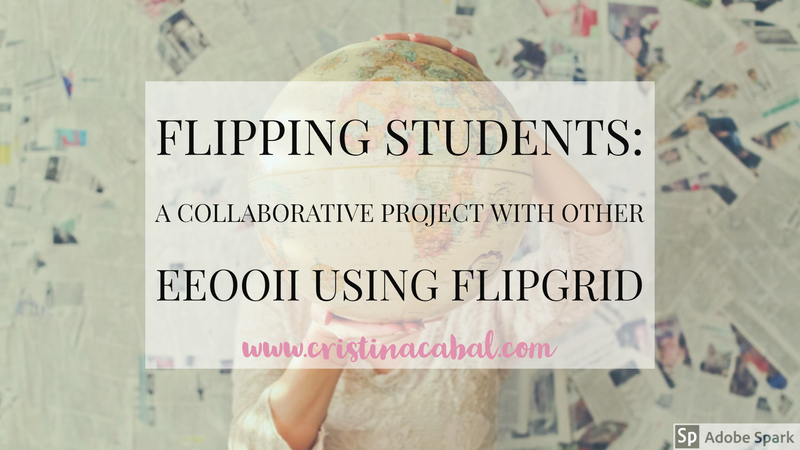 Once the topic has been created, Flipgrid generates a code that you share with your students. This code and a Google or Microsoft email account is all they need. We gave students about a week to record their first video introducing themselves, saying which school they were studying in and their chosen get-to-know-you question. Task 2. They had to choose 3 students from different EEO0II and answer their questions. We asked them to talk for about 1 minute elaborating on their answers as one of the aims of the activity was to practise listening and speaking. To help students and show them how to respond to each other, I recorded a short video tutorial. This second task took longer than the first as they had to record three videos answering to three students. Lots of speaking here, preceded by lots of rehearsing= lots of learning. Note: although at first, it took a bit of convincing, very soon they were really into the project and some students went as far as to record themselves showing some landmarks of their cities and some even dressed up using hats and fake moustaches or wigs. The surprise. As a surprise for the students, and again using social media sites, we asked for collaboration from native speakers and managed to convince a bunch of them to do task 2 as if they were students, too. It was a nice gift for them and a way to say thank you for being such nice sports. Here I want to thank people at Flipgrid headquarters for being so supportive and agreeing to collaborate straightaway. ( thanks George, Rayna, Ann, Karen, Joseph, Kathrina and so many others). I am proud to be a Flipgrid Ambassador. Using our private Whatsapp group, we brainstormed post-project activities. These are some of the ones we did. Mixtapes: A Flipgrid feature that allows you to combine videos from different grids. We created one of these MixTapes using the native speakers’ recordings, playing some of them in class and asking students to first identify the get-to-know-you question and then summarize the answer. Another idea was to ask students to work in groups of 3 or 4, play a get-to-know-you question and ask them to answer it within their groups. Then, play the answers to the question and give a point to the students whose answers coincide with those on the videos. 351 videos recorded, 15,663 views and 89.7 hours of recorded time. I think I can say that without a shadow of a doubt that we have passed this first collaborative activity with flying colours. Thanks Silvia, Purva and Marisa. I could not have done it without you. Before we dive into the content of the post today, I’d like for you to know a surprising fact about me. I love traditional teaching. Yes, chalk and board. 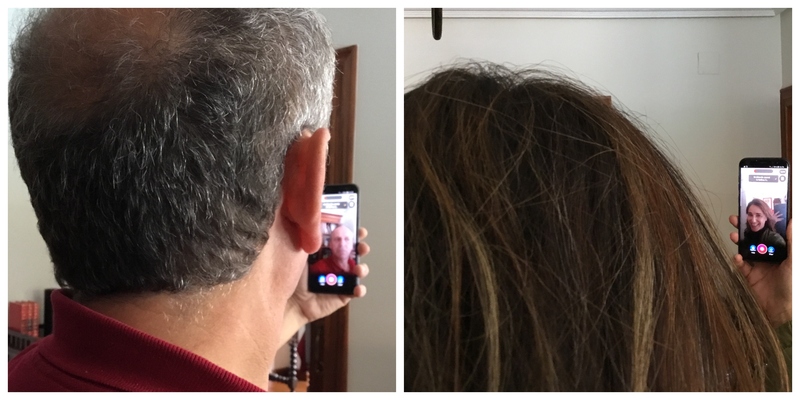 I say “surprising” because if you have been reading this blog for a while, you will have probably noticed how often I incorporate technology in my lessons. True. I love surprising my students with a new idea to revise, learn or consolidate learning using a digital tool, but I absolutely also adore surprising them with an exercise where the only help is their mind, their classmates and occasionally their teacher. If I combine both traditional and digital learning, then it’s just my dream lesson. And this is what you’ll find on this post, the traditional Cristina and an updated version of myself. Which one do I love best? That, I still need to decide. 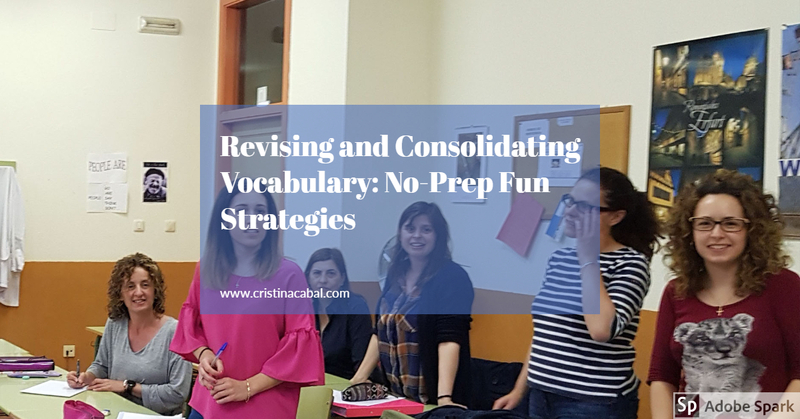 Aim: revise and consolidate vocabulary in a communicative way. Although the ideas below work better for a topic-based lesson- in my case it was used to revise food-related terms-, I think it might also work to revise random vocabulary as long as you specify which vocabulary you want to revise. That’s probably one of my favourite ways to revise the vocabulary learnt the previous days. My students already know me, so when I say: “please, stand up”, they already know what is coming and automatically, it brings a smile to their faces. Instructions: students need to come up with a food-related term from the ones studied in the unit. They take it turns to say their word and I repeat it loud enough for all the class to hear it. This also gives me a good chance to repeat the word that might have been occasionally mispronounced. if he cannot come up with a word in 10 seconds. Big applause for the last person to remain standing and one of the sweets I keep in my candy box. Step 2: Using Slips of Paper. Moving around the class. Once terms and pronunciation have been revised, it’s time to work on meaning. Give students a slip of paper. I use old photocopies printed only on one side and cut them lengthwise. You should get two slips of paper per copy. Ask them to write two terms they would like to revise. Encourage them to write big enough to see the words from a distance (Note: this is unnecessary but I find the bigger their letters are, the easier it is to understand their handwriting). Once they have done so, ask them to make sure they know how to define them. Also, help with pronunciation. Ask students to stand up. The desks in my class form a U so I tell them to move to the centre of the class. Students choose a partner and they take it turns to define their words for the other student to guess/revise. Before they move on to find a new partner, they swap cards. This is a very important step as once they swap, they will need to define/revise other words. After 10 or 15 minutes, depending on the number of students, students sit down, Ask them to keep the last slip of paper they have defined. Step 3:  Asking Open-Ended questions. Now, this is the part where I use technology and one of my favourite tools to get feedback. But, let’s go step by step. Students sit down. Ask them to write down an open-ended question using one of the words on their slip of paper. Tell them some of the questions will be chosen to do a speaking activity. Encourage them to write questions related to the topic, in my case food. Questions are difficult in English so walk around the room helping students. As I mentioned above, this tool is one of my favourites to get feedback. It takes less than 30 seconds to set up the task. Once their questions are displayed, correct possible grammar mistakes and choose 6 or 8 to be discussed in pairs or in groups of 3. I hope you have enjoyed the lesson. Work with me this summer. Practical hands-on workshops to dramatically change your classes using online free tools. Activating Vocabulary in a Reading Comprehension Activity. 10 Games and Activities to Practise Personality Adjectives. Hi! I’m Cristina! Welcome to my blog!